SAN ANTONIO, TX (March 29, 2018) – TMB & PRB Entertainment, presents “Whose “0” Must Go”, live professional boxing Saturday April 21, 2018, from the Mi Mercado Event Center in San Antonio, TX. 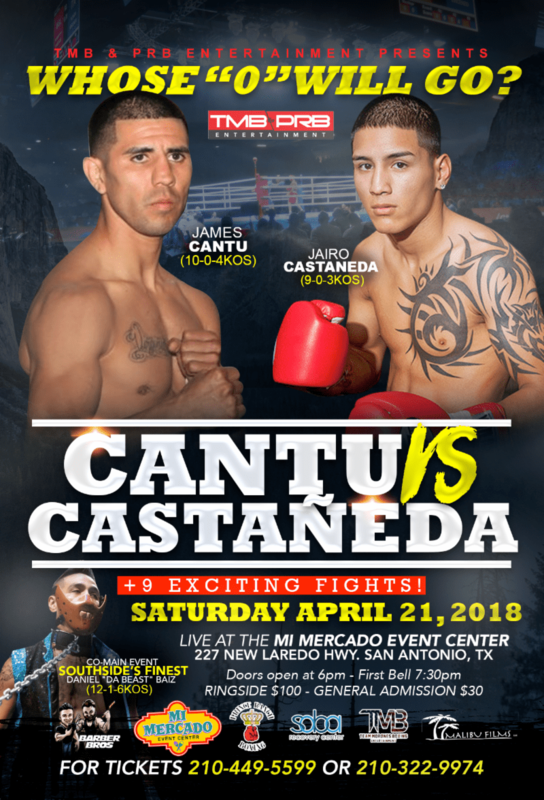 The 6-round main event will feature welterweights, James Cantu(10-0, 4 KOs) vs. Jairo Castaneda (9-0, 3 KOs), two undefeated local natives who will put their unbeaten records on the line, in their hometown. In the 6-round co-main event, local fan favorite, Daniel “Da Beast” Baiz (12-1, 6 KOs), will face an opponent TBA.